welcome to a very special blog hop where the Design Teams from The Ton Stamps and So Suzy Stamps have come together in order to bring you a super special collaboration blog hop. These stamps from two different companies show that different companies can be paired very well together. We will be celebrating November 21st-23rd for three straight days! If you are starting here or have come from Mayline's blog, you are in the right place! GIVEAWAY: A $25 So Suzy Stamps Gift Certificate, a $25 The Ton Gift certificate and a Bunkie Bag are up for grabs! Winners will be announced November 25th for Black Friday Shopping! For those of you that are new to my blog and channel, I have a YouTube channel that you can subscribe to with over 400 cardmaking and stamping tutorials. For this card, I simple stamped the Haute Striped Background in Rose Quartz ink using the Misti stamping tool. I then stamped in black ink on top of the background using the Dancing Fairy stamp and the Flair and Laughter stamp. I added some of the sequins from the Elf stockings pack, mounted the card panel onto some adhesive-backed matte silver paper and called it a day! Your next stop is Tae Eun! Love the stamp of the fairy !!! Too cute! I love your card! Thanks for sharing! Love, love, love! Beautiful card! What a simple and so elegant card! Great idea offsetting with the silver paper, will have to try that. I love this card! The combo is so effortless looking and chic. Love those stripes with the fairy!! Amazing! Looks great! Love the background! Elegant card. Offsetting it on the silver sure makes it pop. Very pretty - your background matches the hop graphic - how cool! Love the angel on that background. I love this card!! I love fairies, so this one speaks to my heart :) This is just so pretty!! very sweet card, the rose stripes are lovely! 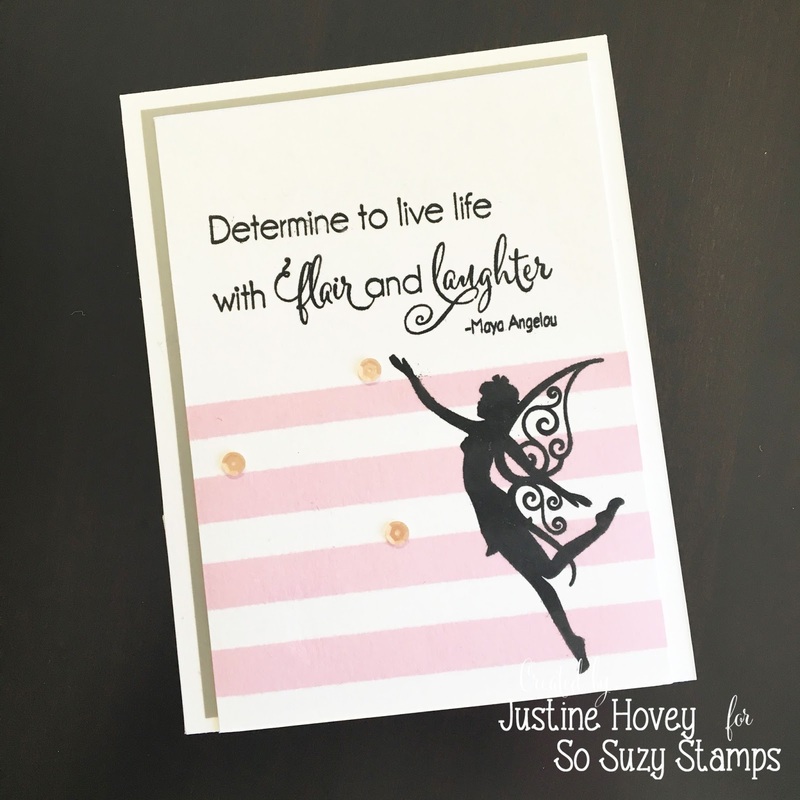 I have to be honest here, I just adore So Suzy fairy stamps!! I love how you set her right on the stripes!! Awesome sentiment too! love that cute fairy silhouette against the pretty pink stripes! How sweet and that little edge of tan/warm gray sets it off perfectly! Love your card! I think the So Suzy and The Ton products go so well together. I have put so many things on my wish list since I started hopping! Love your card! I love the stripes, the sentiment, and the fairy. So cute! What a pretty card and wonderful quote!!! You make gorgeous cards, I love them all. Good to see you here...have been watching your Christmas series. Love the background stamp an Yeah for the Misti. Nice to be introduced to some new stamps. Really love the fairy!! Great card!!! Pretty card! I love the striped background and the beautiful fairy! Great collaboration with these two companies! I'm enjoying the hop! Oh that fairy is great! Great card! Love the pink stripes, perfect with the fairy. So pretty! Very sweet card. I like the pink striped background. I think your color choice was right on point! This card's got a very delicate look to it thanks to the soft pink. The silver paper was also a great idea :) thanks for sharing! This is a great CAS card. Love the contrast of the fairy against that fab background of soft pink stripes! I am beginning to really love fairies! Love it! TFS! Simply gorgeous, thanks for sharing! The flourishes of the sentiment and the delicate scrolling of the fairy wings look like they were meant to go together. Great choices. I like how you positioned them too. Well done! sharon c. Lovely card. Love your choice of sentiment. So very pretty and elegant1 TFS!!! Beautiful and elegant card, love this CAS design and the pink stripes with black color combo. Thanks for another awesome video tutorial. Love this great design! So simple & it really shows off the gorgeous stamp! This is a fairy pretty card! LOVE the stripes and that fairy is lovely! Great card! TFS! Great card! So simple but stunning. Why can't I ever come up with ideas like this? Such a pretty and feminine card! Beautiful! I love the sweet fairie! so cleand and so fresh.